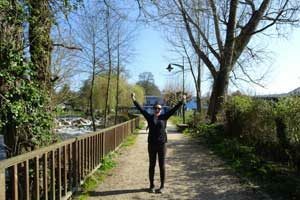 Caroline from Caminoways.com walked the last 111km of the Camino Francés in a very rainy March this year. She tells us her heartwarming story of friendship, fatigue and a lot of wine! It is a truth universally acknowledged that if you are going to walk the Camino, then you must start at the end, and then you come back and do the rest. Or at least was in this case, when my friend and I decided to walk the Camino. 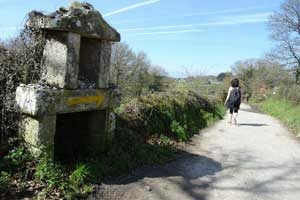 Sarria to Santiago is the most popular, accessible, sociable, serviced, well-marked Camino route. If you’re travelling by yourself, don’t worry you won’t be for long. If one were to attempt to count the number of times you would say ‘Buen Camino’ along the way, one would probably be clocking up as many well wishes as kilometres. The sense of camaraderie on the walk is touching. Everyone is walking in the same direction to the giant spires of the Cathedral of Santiago Compostela, some slower than others but unlike so many things in life the Camino is not a competition. The beauty is in every step and not just at the finish line. 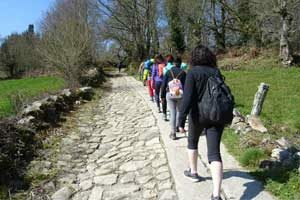 Whether you are 12, 22 or 92, fit and fancy free or weighed down with the weight of the world; whether you are walking with friends or have some personal reason to be taking on the Camino, you will belong on this walk, to this walk and for a little while this walk will belong to you too. So there we were two Irish gals ready to take on the Camino. We began in Sarria, and after a very comfortable night sleep courtesy of the lovely Alfonso Hotel, we joined the meandering stream of fellow walkers, only feeling slightly guilty that the sixty year old woman in front of us was carrying a bag pack that dwarfed her and we (both in our twenties) had only two small rucksacks! That first day of walking was so magical. We didn’t have any idea of what lay ahead of us but we were pleasantly surprised by the serene beauty of the landscape, which of course was made all the more beautiful by the shining sun that our pale, vitamin D starved skin soaked up as we walked! The day flew by we reached the half way mark and stopped for a ‘cerveza’ and a chat with some fellow Caminos and then we were off again, through the rolling hills of the Spanish countryside. First stop was Portomarin which lay at the top of a hill. In order to get to the town you have to walk across this massive bridge where, if unlike me you are proficient at photography, you can see or snap some of the most breathtaking landscape of the whole trip. It was truly such a lovely way to end the first day, and we strolled off into the town intent to feast our bellies as much as we had managed to feast our eyes on the walk. The next day was more overcast, so the precautionary (and by the end of the trip much loved!) fleeces were whipped out and we began the second day trek this time being taking up into a forest walk. The second days walk had definitely more of a Camino feel to it and we really got a sense that we were out in nature and away from society. We walked over so many different terrains: by the road, over hills, in forest and more often than the rest on little lanes sandwiched in between farmhouses and country dwellings. By now ‘Buen Camino’ was like an automated response, but it was still lovely to be issued well wishes by the locals, old farmers bent over their forks, women calling out over walls as they hung out their washing. Palas De Rei was our home for night number three. A lovely, lopsided little town with friendly locals, lovely food and unfortunately for our morning heads, vino a’plenty. The next morning, after a feast of bread and coffee we started on the longest part of the Camino, the dreaded 28km stretch. By this stage it was like an urban legend among us caminoers and had been the favoured topic of conversation the night before as we all lamented not having chosen to split the days! But, as always, our imaginations had run away with themselves and the walk was not as hard as anticipated. For us, the trial of this day was not the many kilometres but the angry rain drops that began to belt of us about half way through the walk! At first we laughed it off, then we cried, then we laughed again. Needless to say it was a bit of a rollercoaster of a day, or maybe a water slide of a day would be more apt here! We got drenched! Despite this, my favourite moment of the whole Camino happened on this day. Myself and my friend were walking through a small village, it was raining very heavily, we were very wet, and we decided to run down hill into the village the rest of the way. There was an old woman sitting in the window of a house and she was staring out at us. Niamh raised her hand and waved happily as we continued to jog by but my eyes never left the old woman, her face lit up with joy and held like that for what seemed a long time. The sight lifted my spirits like even the sun couldn’t, making someone happy can take such simple things in life, a smile, a wave. I can still envisage that old lady’s smile and hope another pilgrim has made her smile again since. And I feel this just brings home the whole appeal of the Camino that being that even in the most horrendous and hopeless of situations, unexpected beauty is just waiting for you around the corner, only of course if you choose to see it. We arrived, two wet, exhausted rats into Arzua. Unfortunately, my account of this little town will surely not do it justice as we spent the best part of the evening eating chocolate in bed and taking shelter from the torrential rain that continued to batter the walkers still en route! The only thing I do remember was that the food in Arzua and in particular in the Teodora hotel was definitely the best and most authentic we had on the whole trip. Our next day of walking was decidedly more relaxed, neither our minds nor bodies were up for much so we took our ease this day. The countryside was very picturesque this day, once again we found ourselves travelling through so many different terrains. But, this day was our first introduction to the giant, and I mean giant eucalyptus trees that would become a staple of the remainder of our walk. Even now as I’m walking in the city, whenever I get a whiff of eucalyptus I am instantly transported back to the woodland parts of the Camino, and the buildings and skyscrapers around me transform into the towering eucalyptus trees that rose up and blocked out any sense of an outside world and chaperoned us through the Camino. Also, on this day we met a lovely, wise old man, your typical Gandalf figure. As we walked he shared his knowledge about the local countryside and before we knew it we had arrived in Amenal, which is a built on top of a tunnel! Be careful not to blink toward the end of day four as you might just miss Amenal and end up in Santiago at about midnight. After much wine and much rest we embarked, a little reluctantly, on the final day of our Camino. The last day of walking seemed to fly by. The first half is through some lovely countryside, and small villages and then the remnants of ‘real’ life begin to emerge as you get closer to Santiago. Bigger roads, cars, busyness and it was with slightly heavy hearts that we left the still and peaceful countryside behind us and began the final leg of the trail, through the bustling streets of Santiago de Compostela. The city itself is very beautifu l. Cobbled and jam packed with Gothic architecture, like something from Harry Potter! We reached the cathedral and collapsed in a bittersweet huddle with the many other caminoers that had finished. We then posed for a few token ‘WE MADE IT’ pictures in front of the cathedral and then headed inside for the Pilgrim Mass that was just getting underway. The inside of the Cathedral is breathtaking, a sight that really has to be viewed with your own eyes. Hi Mary, Caroline started walking at between 8:30 and 09:00 each morning, no earlier. It shouldn’t be very hot in September. There is plenty of woodland walking on that section too, so won’t be under direct sun all the time. Take a break at lunchtime, if it gets hot but also to have a bite and a good rest. Since your accommodation will be booked, there is no rush: find your pace, take your time and enjoy it! We hope you have a lovely trip, Mary. Hi Erin, some of the longer walking days can be split in two (mainly depending if there is accommodation available in the area). The section from Sarria to Santiago that Caroline walked, can definitely be organised to walk shorter distances per day, have a look at the ‘booking’ tab here (easy walking over 10 days has an average of 12kms per day): http://caminoways.com/ways/french-way-camino-frances/french-way-section-8. I hope this helps, Erin! Anything else, let us know! Sounds perfect but what if someone knows they can,t make the 28kms in one day! Any suggestions? Thank you Anna! Wishing you a lovely time on the Portuguese Way! Thank you for sharing your special time with us. We are coming to do the Portugese Way in September and reading about your experience simply adds to our excitement. 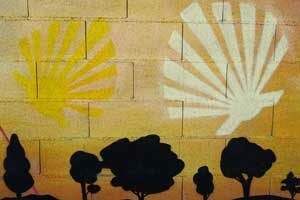 Hey, Shelagh, I stayed in the hotels booked by Camino Ways for this trip I took in the first week in May. All of them were immaculately clean and comfortable. The staff were all extremely helpful and thoughtful. I highly, highly recommend Camino Ways!!! What a beautiful story and much like the experience I had along with my Camino family of 17!! Between the challenge of all the walking, the beautiful scenery, the fellow-pilgrims, the wine & awesome food, I received the best gift of all – I came away with peace in my heart and grateful that God had blessed me with this journey unlike anything I’ve ever experienced before. In our busy lives, how often do we truly stop to enjoy and take-in the beauty that surrounds…beginning with the people in our lives! I plan to do this again along with my husband. Our daughter was part of the journey and she plans to do the entire journey which takes about 35 days. I returned feeling different and I pray that this experience, this journey will remain in my heart and in my mind forever!! Thank you for sharing your experience, Brad!